ww2dbaseEva Anna Paula Braun was born in Munich, Bavaria, Germany in 1912 to school teacher Friedrich Braun and Franziska Kronberger. After completing her studies, she worked as a receptionist at a medical office, and then in 1929 worked as an office assistant and model for photographer Heinrich Hoffmann, who was the official photographer of the Nazi Party. Through Hoffmann, she met Adolf Hitler in Oct 1929. They began seeing each other romantically around 1931. Although the two took liking to each other, Hitler courted other women at the same time, some of whom were driven to suicide. Braun, too, resorted to such measures twice, with the first on 1 Nov 1932 and again on 28 May 1935. After the second suicide attempt, Hitler seemed to have become more committed to her, providing her with a mansion in Munich, a Mercedes sedan, a chauffeur, and a maid. On 30 Jan 1933, when Hitler became the Chancellor of Germany, she sat in the VIP section as his secretary. By 1936, she was living with Hitler at Berghof near Berchtesgaden in southern Germany, and two years later, in 1938, Hitler named her his primary heir. Nevertheless, Hitler and Braun never appeared in public as a couple, and the German people would not learn of their relationship until after the war. Although close to Hitler, she was not allowed to be near any conversations between Hitler and government and military officials, although she did often act in the capacity of a hostess at dinner parties with Hitler's inner circle. 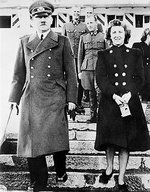 Her relationship with him was strained by his lack of time and energy for her, particularly after 1943, and over time had picked up drinking and smoking as an outlet, which displeased Hitler. In mid-1944, Braun began appearing in public with Hitler, but those engagements were limited especially as Hitler became more reclusive after the failed July Plot assassination attempt. In early Apr 1945, as Soviet troops neared Berlin, Germany, Braun traveled to Berlin to be with Hitler. Underground at the Führerbunker below the Reich Chancellery, she refused repeated attempts by various people to take her to a safer location. In the morning of 29 Apr, Braun, in a dark silk dress, married Hitler in a small civil ceremony in the bunker with Joseph Goebbels and Martin Bormann acting as witnesses. At about 1300 hours on 30 Apr, together with her new husband, she bid farewell to the others at the bunker. At about 1530 hours, she committed suicide by ingesting cyanide while Hitler also killed himself. Their bodies were burned in the garden of the Reich Chancellery. Their charred remains were found by the Soviets, who secretly buried them in Magdeburg, East Germany. In Apr 1970, the remains were exhumed, cremated, and dispersed into the Elbe River. 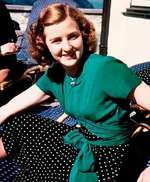 6 Feb 1912 Eva Braun was born in München in southern Germany. 1 Nov 1932 Eva Braun attempted suicide by shooting herself in the chest with her father's pistol. 28 May 1935 Eva Braun attempted suicide by taking Phanodorm, which was a drug usually prescribed to help with sleeping. 15 Apr 1945 Eva Braun arrived in Berlin, Germany. 29 Apr 1945 Eva Braun changed her legal name to Eva Hitler after marrying Adolf Hitler. 30 Apr 1945 Eva Hitler committed suicide in the Führerbunker in Berlin, Germany by ingesting cyanide.